With 2016 safely in our rearview, we wanted to look back at some of the most spectacular photos of Dallas taken this past year as we dive into 2017. We scoured Instagram to find the best pictures taken by some of our favorite photographers that exemplify this amazing city and remind us all why we love it. We can’t wait to see what the new year holds in store. The best Ferris wheel in this great state. Can’t beat that iconic skyline. Bluebonnet season is the best season. An aerial view of that gorgeous Texas sunset. Our city came together as #DallasStrong following tragedy in July. Dallas pays it respects at a candlelit vigil. The Majestic looking, well, majestic. Margaret Hunt Hill Bridge is so damn photogenic. Can’t pass through Deep Ellum without snapping a pic of the famous Traveling Man. Views from the top of iconic Reunion Tower. The Hyatt Regency reflecting the blue skies of Dallas. The standout red glow of the Winspear Opera House. One of the few pics that did the Supermoon justice. Don’t forget to look up at the Chapel of Thanksgiving. Arguably the coolest museum in the city. That stadium saw a lot of W’s this year. Klyde Warren gets #lit for the holidays. Cotton candy skies at sunrise. Dallas says farewell to 2016. Bring it, 2017. Kelsie and Lexi Aziz are the sisters behind the blog Pizza and Champagne. 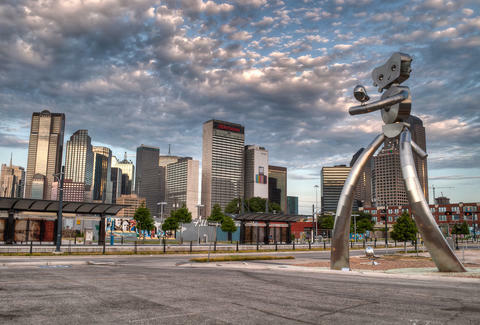 As born and raised Dallasites, they spend most of their free time exploring the Big D and hunting down the best queso. Follow their adventures, whether they’re in the kitchen or another country, on Twitter and Instagram.